Love me some peanut butter! 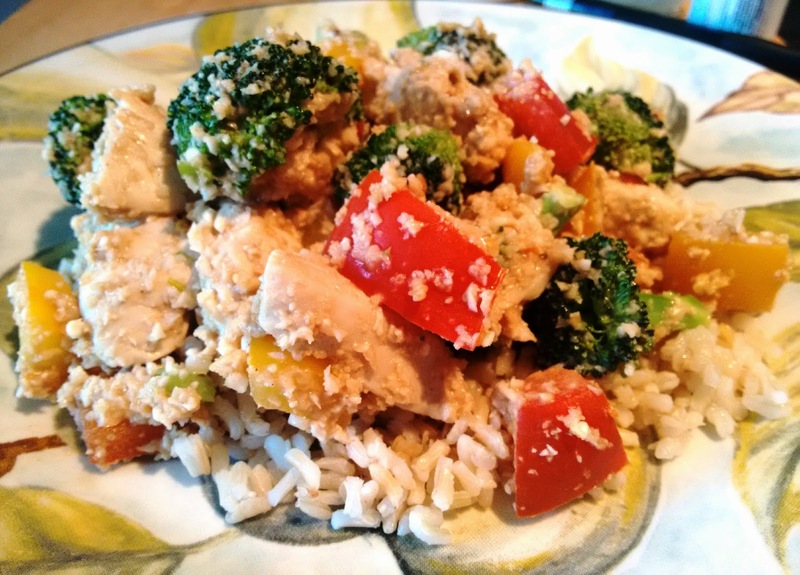 This stir fry has a Thai flavour to it, but I'm sure it is not quite there, since it was just a combination of ingredients I had on hand to make a nice, thick sauce, so I'm just going to call it a peanut butter sauce. I used a combination of 'cauliflower rice' and instant brown rice, but you can do either by itself. Add cauliflower to food processor and grind into rice sized pieces. Set aside. Add sauce ingredients in a bowl and mix well with a fork, until sauce is uniform. In a wok, add sesame oil and set to medium heat. Add chicken pieces, and stir often, until fully cooked. Remove chicken from wok and set on a plate. Increase heat to high. Place minced garlic in wok and cook until fragrant. Add broccoli, peppers and green onions to wok. Stir constantly, and cook until vegetables are hot, yet maintain crispness. Add cauliflower rice, followed by half of the sauce. Stir to coat, then add the chicken and the remaining sauce, and stir again to coat. Plate a serving of rice and add the stir fry on top. Optional: Sprinkle with ground peanuts.